But the truth is taxpayers subsidize not the actual transportation cost of the ordinary worker, office employee or student who regularly uses the MRT. Profits are being squeezed from taxpayers and commuters for guaranteed debt payments and profits of the transnational banks and big comprador firms that undertook the MRT project through Public-Private Partnership (PPP) – yes, the same type of development initiative that Aquino said his administration will pursue. Thus the so-called “subsidies” go the Export-Import Bank of Japan, Sumitomo Bank, and other Japanese and Czech banks, as well as some local banks like the Bank of Philippine Islands (BPI). What made the deal more financially onerous was that the banks that provided the loan of US$462.5 million in 1998 and the private firms that constructed the MRT have the same owners. MRTC included the Ayala Land Inc., owned by the Ayala family which also controls the BPI. MRTC also entered into an Engineering, Construction, and Procurement (EPC) Contract with the Sumitomo Corporation, owned by the same Japanese investors that control Sumitomo Bank. Foreign lenders (Japan provided US$278.5 million while the Czech Republic, $88.4 million) also apparently “tied” their loans for the MRT, thus further maximizing profits for their exported capital (i.e. we pay for the principal plus interest for services and goods that come from the same country). Japanese Sumitomo Corporation used, as principal subcontractors, Japanese TNC Mitsubishi Heavy Industries for the civil works, track works, and electro-mechanical work, and Czech Republic-based CKD Dopravini for the manufacturing, testing, and commissioning of the rail vehicles. In fact, the BLT was so financially burdensome that government started missing paying debts on time. Consequently, the government through the Land Bank of the Philippines (LBP) and the Development Bank of the Philippines (DBP) initiated an $800-million buyout of the MRTC to acquire 76-percent equity last year. The move was meant to terminate the guaranteed 15 percent return, that was supposed to last until 2025 (end of the BLT deal), by providing a lump-sum payment. But in the end, Filipinos through our taxes will still shoulder this lump-sum payment. If the MRT fares will be increased, taxpayers will be paying for this exorbitantly priced PPP project twice over. Meanwhile, aside from cashing in on the guaranteed profits and the lump-sum payment, MRTC firms have been raking additional profits from other investments made more lucrative by the MRT. The Ayalas, for instance, have built the TriNoma Mall in 2007, which is directly linked to MRT’s North Avenue station. 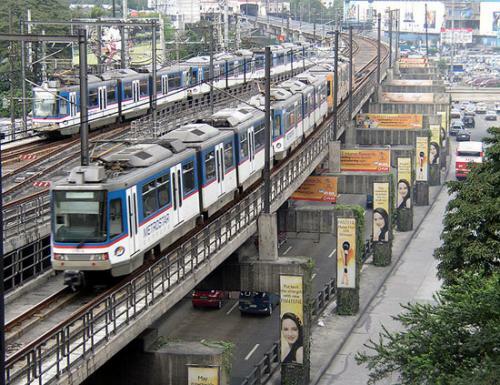 The MRT also made the Ayala Center commercial complex in Makati City more accessible and thus more profitable. Fil-Estate, which is also part of the MRTC consortium, on the other hand, had as early 2000 secured a P1.4-billion investment from the Bank of America to develop high-rise real estate projects along the MRT system. And consider how a privatized and deregulated power industry has resulted in skyrocketing electricity costs – a major input in MRT/railway operation. If you want to just take the bus or jeepney because you can no longer afford a train ride, you will still have to contend with increasing fares because the oil industry is deregulated. Hindi naman tumataas ang sahod mo. O swerte ka nga kung may trabaho. Ito na ba ang matuwid na daan ni Noynoy? Very good analysis. Pro-people, versus the oligarchs. Keep it up, Educate the PeNoys of the land. am just bothered by your article because you stated that land bank and dbp acquired 76% of mrtc at $800 million? you must be in the know to get these facts..
you also mentioned about the oligarchs in our country, they have the capital and the guts to invest in infrastructure, banks, etc..so siguro fair lang na may return yung guts and capital nila.. dapat lang natin sila husgahan kung mapapatunayan natin na inagaw nila ang karapatan na mangapital sa hindi nila kasing-yaman or kung naglagay sila sa kung sinuman ang nasa posisyon para mapunta sa kanila ang malalaking projects dito sa bansa natin.. kung may pruweba ka, ilabas mo para masingil natin kung sinuman yung government official na nilagyan ng mga oligarchs. yung mga government officials kasi ang nag-approve ng kontrata nila. mahirap kasi yung haka-haka lang kasi baka balikan ka ng mga inaakusahan mo at kasuhan ka.. kung may katunayan, di lang siguro dapat ilagay sa blog, dapat isumbong para makasuhan at masingil sa mga kinurakot..para di na pamarisan. yung acquisition ng lbp at dbp sa mrtc ay matagal na pong nasa balita at hindi sikreto. pero hindi yun ang isyu. ang argument ko ay pinalaki ang cost per passenger ng mrt ng terms ng kontrata at ng utang. itong terms ng kontrata ay available rin sa publiko. totoo naman na nangyari ang mga ito before noynoy. the contract was signed during the ramos admin. pero ang responsibility ni noynoy ay i-ensure na wag ipapasa sa commuters ang burden through an onerous fare hike (dahil pinapasan na natin thru our taxes) at wag nang i-reprivatize. pero determinado si noynoy na i-pursue ang mga ito at mukha pong sasama kayo sa amin sa rally. Thanks to this post that I found out the real story behind MRT. I thought, the fare increase is just fair considering that it’s been a long time since the railway system asked for an increase.